Should one switch off an AGA in summer? For the last two or three weeks I've been vaguely wondering whether we should switch off the AGA. Now with the weather getting seriously sticky it's getting positively uncomfortable to sit in the kitchen - a problem since that's where we eat. It's also, obviously, where we cook and where we dry clothes. No AGA = a trek to the launderette every time we change the sheets. The main problem though is that there are no alternative cooking facilities other than a kettle (we rent our current flat) which is presumably why AGA owners keep them blasting away year-round. When I checked online just now I couldn't find an AGA expert who recommended switching them off. Well, we're going to - at some expense I have to admit. We've just been out and bought a cheap toaster and a not-so-cheap Cuisinart Contact Grill which I fancied anyway as grilling isn't the AGA's strong suit. And tomorrow we're going to try and pick up a plug-in induction ring (having taken the precaution of snapping up a set of induction hob-compatible pans from Tesco. A fantastic bargain at £17 for 3 had I not had a pretty good stock of pans already.) We also have a slow cooker and a Remoska cooker so I'm hoping that will see us through to September. We won't be able to do a slap up roast or grill or bake but it leaves us with a reasonable range of summery possibilities. Of course chances are the weather will suddenly turn and we'll be freezing in a week's time in which case all this expenditure will turn out to have been unnecessary. So I'm fascinated to know what the AGA or Rayburn owners among you do? Do you plough on, sweltering or do you have a conventional cooker as a fall-back? Just to show that the current leftovers jag is still in full swing today I managed to rustle up another pasta dish with the remains of Friday's feast and a few other odds and ends from the salad drawer. In effect it was a double pasta sauce. I fried a sliced onion and red pepper for about 7-8 minutes until they were beginning to brown then stirred in a couple of cloves of crushed garlic, a tablespoon of tomato paste and a chopped tomato. I left it bubbling away while I cooked about 200g of Mafalda corta pasta with a handful of green beans, adding a few sugar snap peas towards the end of the cooking time. I spooned off a couple of tablespoons of the pasta cooking water into the tomato mixture (a good trick - thickens the sauce), drained the pasta and vegetables then returned them to the pan and stirred in a tablespoon of olive oil and a good dollop of the leftover pesto from last week. I chucked a few leftover basil leaves into the tomato sauce then served up the pasta and beans with the tomato sauce on top. Could have added more parmesan but simply ground over some seasalt and black pepper. A cheap, simple lunch for two that looked a great deal sexier than its unpromising ingredients . . .
As time goes on I'm more and more convinced of the virtues of shopping as and when you need it rather than doing a big weekly shop. We're still living off the leftovers of the supper I cooked for friends on Friday night - admittedly with a couple of food gifts: a carton of lettuce and pea soup (made to use up leftover leaves) from Stephen Markwick of Culinaria who I dropped in to see on Saturday and a highly original gift of gulls eggs and n'duja, a very spicy Calabrian sausage from one of our guests, fellow food writer Xanthe Clay. Our lunch today must be the least conventional fry-up ever: gulls eggs, bacon and n'dula on toast! The meal itself was a slow roast joint of pork with fennel, a roast butternut squash and red pepper couscous salad, a lentil, lemon and grilled artichoke salad and a cooked tomato, sugar snap pea and green bean salad with pinenuts. We had the leftover salads with half the leftover pork on Saturday and the remaining pork heated up with some fantastic pan juices and a watercress, spinach and rocket salad I'd forgotten to serve up on Friday, last night. There was also quite a bit of leftover cheese which made a great companion for the pea and lettuce soup. If I'd shopped for the weekend on Friday I would almost certainly have overestimated how much we we would eat and bought far more food than we needed. As it is I reckon I can eke out another meal from bits and pieces in the fridge before going to the shops tomorrow. There's half a carton of cream that needs using up for a start . 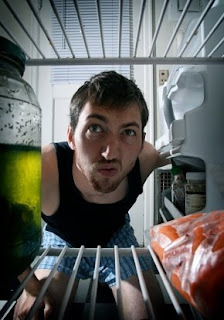 . .
What have you got leftover from the weekend and what are you planning to do with it? I'm on a bit of pesto kick at the moment. The local greengrocer is full of fat bunches of basil and there's no other way to use one up before it goes off even if you add basil to everything. Not that making pesto is a hardship. It's so bright and flavourful and vivid in flavour - light years away from the drab, almost khaki-coloured paste you get in jars. Anyway it's a nice recipe potentially for you other pesto addicts out there . . . Put a large pan of water on to boil, add salt and cook the spaghetti or linguini following the instructions on the pack. While the pasta is cooking heat the oil in a frying pan and add the tomatoes. Cook over a medium heat, shaking the pan occasionally until the tomatoes are soft and beginning to char. Chuck in the oregano if you have some. Drain the pasta reserving a little of the cooking water then return to the pan. Spoon in the oil you used for cooking the tomatoes then add the pesto and a couple of spoonfuls of cooking water and toss well together. Tip the pasta into warm bowls, top with the roasted tomatoes and shave or grate over a little parmesan. What am I going to do with the rest of the Sacla pesto that's now sitting accusingly in the fridge? Mix it with breadcrumbs and make a topping for fish. Add it to sandwiches. Stir it into a soup. Possibly zip it up with some more fresh basil - although I'd rather use any new basil for a fresh batch of homemade pesto. Any other ideas? I know I've been banging on incessantly about how cheap cuts are no longer cheap but here's a perfect illustration. 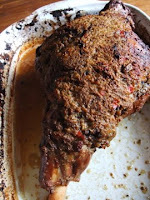 Incited by my recent observations that men aren't as frugal as women when it comes to food shopping, my husband picked up a half price leg of lamb for £8.99 in Somerfield the other day. There was a time when I would have conscientiously trotted down to the shops and bought every ingredient in the recipe but apart from picking up a large pot of yoghurt made do with what I had from an admittedly well-stocked spice cupboard. I scaled down the spicing slightly reducing the garlic from 8 cloves to 4 and replacing the recommended 4 green chillies with 1 red one and also omitted the blanched almonds which was perhaps a mistake as the marinade split making the dish initially look as if it was covered in cat sick - as my husband somewhat tactlessly pointed out. In the end I poured off the marinade, skimmed off the fat (a good move) and strained it then whizzed the solids in a food processor and added enough of the liquid back to make a thin - and delicious - sauce. We had it with friends on Friday with a dry cauliflower and potato curry and some green beans with tomato and garam masala and have been scoffing the leftovers over the weekend. With seconds at I reckon we got 10 servings out of it which comes to less than £1 a head. Which is more than you can say for lamb shanks these days. It's been a manic week on the work front so I thought I might dig up a recipe from The Book. (There is a Frugal Cook book in case it's slipped your notice ;-) I also had a rather enticing pic of it I remembered I hadn't published. The main pleasure of eating chicken wings is the lovely sticky, finger-licking, almost Marmitey goo you get if you cook then sufficiently long, a texture and flavour that sometimes gets masked if you cover them with a marinade. If you can have salt and pepper squid I thought, why not salt and pepper wings? It cuts down on the other ingredients you need to use and makes them more child-friendly. A good dish to make when you have the oven on for something else. Pre-heat the oven to 180°C/350°F/Gas 4. Put the wings in a large roasting tin - or two smaller ones, pour over a little oil and turn the wings so they are lightly coated with oil. Season generously with freshly ground salt and coarsely ground black pepper and roast for 1 - 1 1/4 hours, turning the wings two or three times. Remove the wings from the roasting tin, rolling them in the pan juices to pick up any delicious sticky bits and leave until cool enough to handle (about 15-20 minutes). Eat warm or cold (but they’re never as good once they’ve been refrigerated) Save the fat from the pan which has a fabulous flavour. Chicken wings seem to be one of the few 'cheap cuts' that still remains cheap. Have you noticed cheap cuts going up in price? There's an interesting trend I've been noticing over the last few weeks and months which is that almost all my followers and most of the people who comment on this blog (with a few honourable exceptions) are women. Does that mean men aren't frugal? I think it actually says more about the dynamics of blogging than about frugality. Women are more prone to support and get involved with a blogger they like than men are, I would say but there is an interesting point here which I was discussing with a colleague on a work trip I've been on this week (hence the gap in posts) which is that men are frugal in a different way. Men, I reckon enjoy the hunter-gatherer aspect of frugality. Bagging bargains. Going off and killing or catching things, foraging for wild foods. Although there are of course exceptions, women generally have a more domestic take on the subject. They're better at handling a household budget, planning a week's meals and using up stocks. Which is why the man traditionally handed the woman the family's housekeeping money. Or maybe I'm totally wrong . . . Male readers, do come out of the woodwork and tell me how frugal you are. Women - tell me how you leave it all up to your man. Or not . . . What happens in your household?